It is always fun to renew old friendships as the years pass by. This weekend, two friends from childhood and high school spent the weekend. Ed Heutink was a childhood buddy in Lynden from as early as elementary school. We ruled the streets of Lynden with our stingrays and minibikes. Ed and Tanya now live in Ferndale with an active family that ranges in age from 24 to 2. Rick Doughty became a close friend in high school as our home was a home away from home for this Mt. Vernon native. Our friendship in college developed around theological discoveries and he was the best man in my wedding. 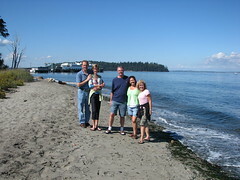 Rick and Sally live in Beaverton, Oregon with their three teenage children. It was a great weekend of sharing each other's life journeys. It was great spending time with you guys and I hope we can spend more time together in the future.